When: Saturday, February 28, 2014 at 10:00 p.m.
Boom! Boom! 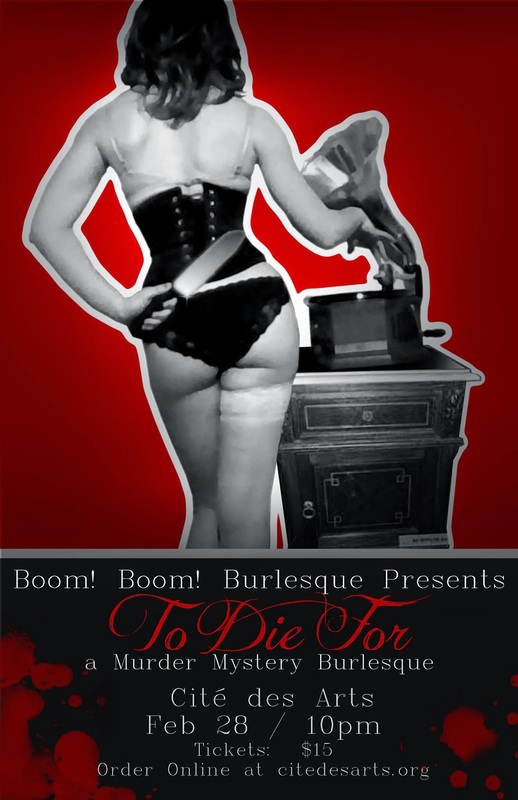 Burlesque invites you to an evening of singing, dancing, peeling and murder! Follow Detective Phineas as he leads a trail of exciting entertainment and attempts to bring the titillating but guilty parties to justice. Don your favorite old Hollywood garb and join us at Cite des Arts on Saturday, February 28 at 10 pm to laugh, hoot, holler and shriek while you discover who you're willing To Die For! This full-cast show offers a range of performers to bring you the very best of modern and classic burlesque in the true Boom! Boom! style; featuring vaudeville-inspired solo and group acts with all manner of empowered and talented ladies and gents to thrill and delight you. Admission is $15 at the door or tickets may be purchased online at CitedesArts.org or by calling 337-291-1122. To Die For is for adults 18+.